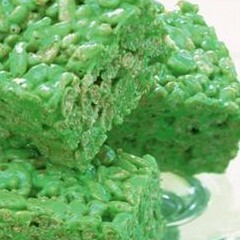 Marshmallow rice treats with food coloring to match your favorite holiday/event! Add the marshmallows and food coloring and stir until the marshmallows have melted. Stir in the Kellogg’s Rice Krispies cereal coating them well with the melted marshmallow mixture. Using a buttered or silicone spatula, press the mixture evenly into a 13 x 9 x 2 inch pan which has been buttered or sprayed with non-stick spray or lined with wax paper.